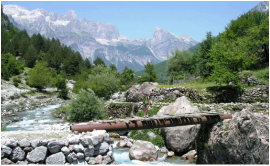 Shkoder, Thethi, Kruja, Valbone, Vermosh & Lake Koman Excursions. Overnight trips. Valbone, Vermosh & Thethi Guesthouse Hotel & Bus. Hike in the Alps. - Lake Shkodra Resort, Shkoder, Albania. Camping, Glamping Hotel, Lodge, Holiday Accommodation. Restaurant & Bar. Excursions to Lake Koman, Shkoder, Thethi & Kruja. Thethi Guesthouse Hotel Booking. A boat trip on Lake Koman is often described as one of the great boat rides of the world, passing through magnificent and rugged fjord-like mountain scenery. You leave in the morning and arrive at Koman where you will board a private boat. You will make your way through the truly breathtaking scenery on a boat ride to a local guesthouse, where lunch is served. You will have an opportunity to swim in Thethi river that runs into the lake. You will return by boat to Koman and then by road to Lake Shkodra Resort. Lunch included in price. See the Albania page for the Guardian's newspaper article about the journey. Excursion leaves every day in season. Now running every day! Must be booked day before departure. Note - The Lake Koman passenger ferry leaves Fierza (to Koman) at 6am and returns (to Fierza) at 9am from Koman. 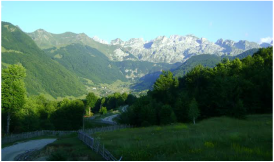 Visit Thethi in the Albanian (Dinaric) Alps, one of the most remote and untouched villages in Europe. Leaving in the morning and making your way up the high mountains to Thethi. Experience lunch (included in the price) in an old family run guesthouse, where you can sample a traditional Albanian cooked lunch. Spend the afternoon visiting the church in the centre of Thethi or stroll through the picturesque valley. Returning to Lake Shkodra Resort later in the day. Price includes lunch. Minimum of 10 people required. We leave Lake Shkodra Resort in the morning. You will have the day free to explore the old bazaar, Kruja castle, the national historical museum and the national ethnographic museum. The mini-bus will then pick you up in the afternoon and return to Lake Shkodra resort. Please note - a guide will not be present on this trip, pick-up and drop-off only. Minimum 4 people. Leave Lake Shkodra Resort and head to the Lead Mosque - built 1773. You visit Rozafa Castle, first constructed 350 BC, and view the remaining buildings from the Illyrian, Venetian and Ottoman period. At 130 meters above sea level, the views of Shkoder, the lake and river provide a great photo opportunity. You will with then go to the newly renovated center of Shkodra, where you'll have a few hours free for lunch and to explore the oldest city in Albania (2,400 years old) and once the most important trading posts between the East and West. With its beautifully restored old Venetian architecture, cobbled streets, restaurants, shops, art galleries and market stalls you'll have plenty to see and explore. (see photos above). Then meet and take a short walk to the Marubi Photographic Studio. The exhibition displays a selection of the Marubi family's 150,000 photos of Albania, some dating as far back as 1858. You will then visit Albania's best preserved Ottoman bridge - Mes bridge (photo above). Returning to Lake Shkodra Resort. Price includes entrance fee to Rozafa Castle and Marubi Gallery, lunch not included. Minimum of 10 people required. Lake Shkodra Resort to Thethi/Theth or Thethi to Lake Shkodra Resort or Shkodra city center. Bus picks-up and stops on route: Lake Shkodra Resort to Thethi or Thethi to Lake Shkodra Resort. 2.5 hour journey. Babies 0-1 free when sitting on adults lap. Price includes seats being reserved and booked by Lake Shkodra Resort.